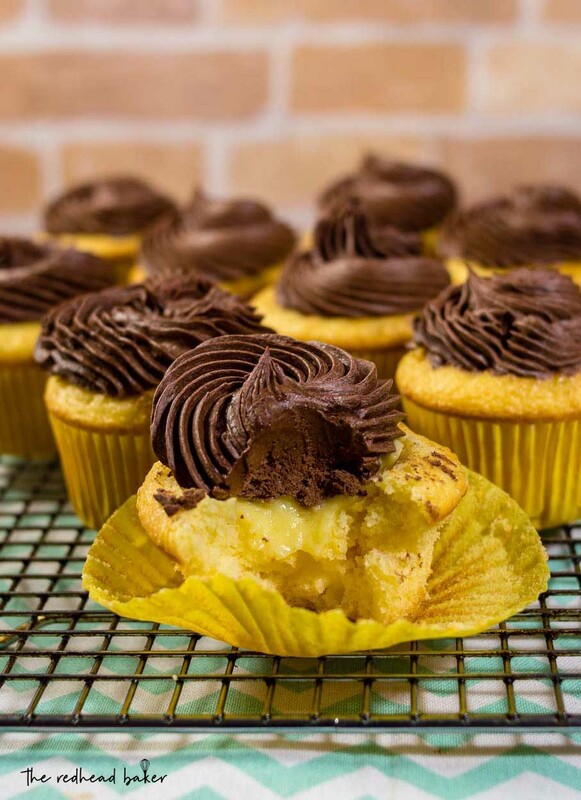 Boston cream cupcakes have all the flavors of Boston Cream Pie in cupcake form: buttery yellow cake, vanilla pastry cream filling, and rich chocolate ganache frosting. 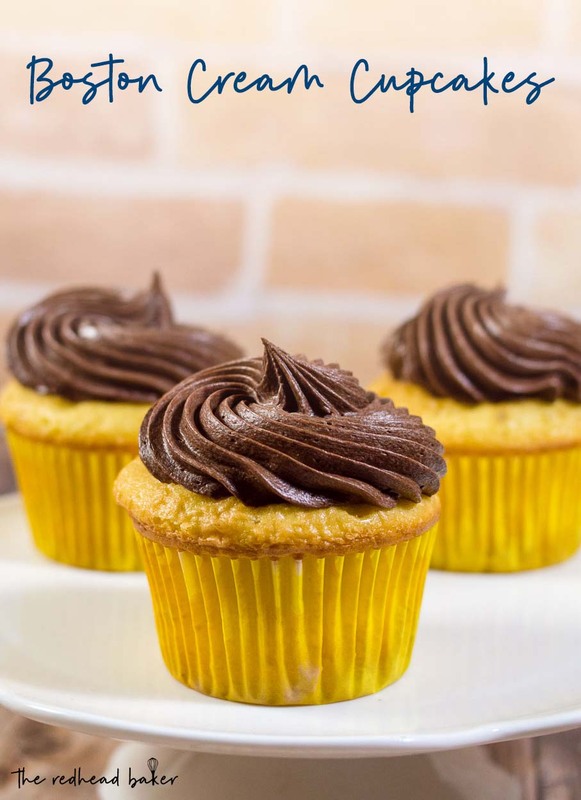 It’s time again for Baking Bloggers, and this month’s theme is cupcakes. I might love cupcakes even more than I love cake. They have built-in portion control, the flavor combinations are endless, they’re less work than cake, and you can make adorable decorations that won’t work on full-size cakes. These cupcakes are a variation on Boston Cream Pie, which is actually a layer cake with pastry cream filling and a glaze of chocolate ganache. 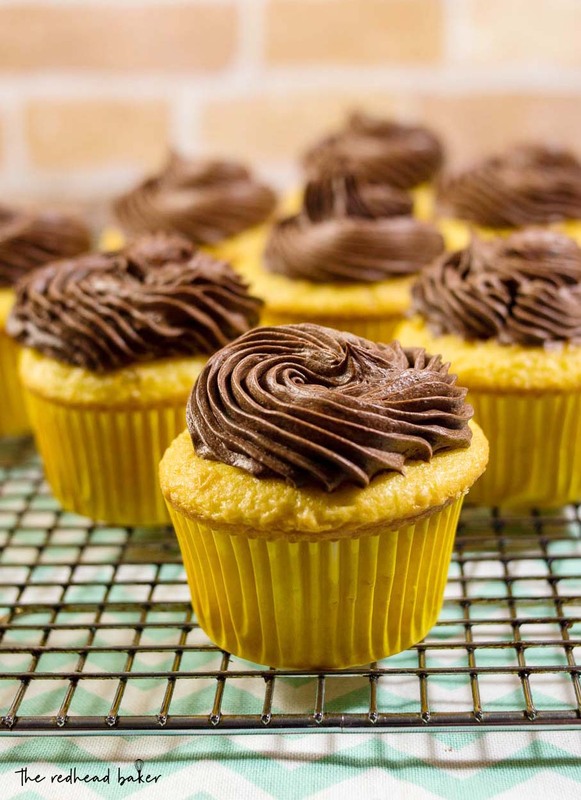 Instead of two layers of cake, these cupcakes are filled with a dollop of pastry cream and topped with whipped ganache. The original Boston Cream Pie used a sponge cake, but I’m not very partial to that type of cake. Instead, I used Rose Levy Berenbaum’s Downy Yellow Butter Cake, a delicious buttery cake from her cookbook The Cake Bible. I used a paring knife to make a hole in the middle of each cupcake for the filling. Pastry cream is a staple of French baking. It’s the same custard that is traditionally used to fill eclairs. It can also be served with fresh fruit for a light dessert. The cream can be flavored with chocolate, fruit puree, caramel, etc., and used to fill tarts, cakes, and more. The finishing touch, the ganache frosting, is so simple. Ganache is very versatile. When warm, it’s a liquid, and can be used to glaze cakes, pastries, tarts, etc. When chilled, it can be rolled into truffles, or whipped into frosting. The result? Delicious little Boston cream cupcakes! 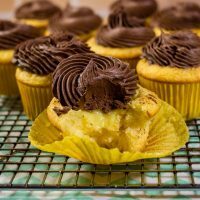 Keep these cupcakes stored in your refrigerator, and take them out about 30 minutes before serving so that the ganache frosting can soften. In medium bowl, whisk together 1/2 cup milk, egg yolks, 1/3 cup sugar, and cornstarch. Transfer remaining 1 3/4 cups milk to heavy medium saucepan. Scrape in seeds from vanilla bean; add pod. Sprinkle remaining 1/3 cup sugar over, letting sugar sink undisturbed to bottom. Set pan over moderate heat and bring to simmer without stirring. In a double boiler (or in the microwave using a microwave-proof bowl) meal chocolate chips and whipping cream together and stir until smooth. Place in your stand mixer, add vanilla extract and using the whisk attachment, whip until stiff. It should take 4-5 minutes. If the frosting doesn't stiffen enough after 5 minutes, add 1/4 to 1/2 cup of powdered sugar and beat another few minutes. Preheat the oven to 350°F. Line two muffin tins with paper liners. In a medium bowl lightly combine the yolks, 1/4 cup milk, and vanilla. In a large mixing bowl combine the dry ingredients and mix on low speed for 30 seconds to blend. Add the butter and the remaining 3/4 cup milk. Mix on low speed until the dry ingredients are moistened. Increase to medium speed (high speed if using a hand mixer) and beat for 1 1/2 minutes to aerate and develop the cake's structure. Scrape down the sides. Gradually add the egg mixture in 3 batches, beating for 20 seconds after each addition to incorporate the ingredients and strengthen the structure. Scrape down the sides. Use a large scoop to fill each cupcake liner halfway full. Bake for 20 minutes, rotating the pans 180 degrees and switching the top pan to the bottom and vice versa halfway through baking (this ensures even baking), until a tester inserted near the center of a cupcake comes out clean. Let the cupcakes cool in the pan on racks for 10 minutes, then remove to a wire rack to cool completely. 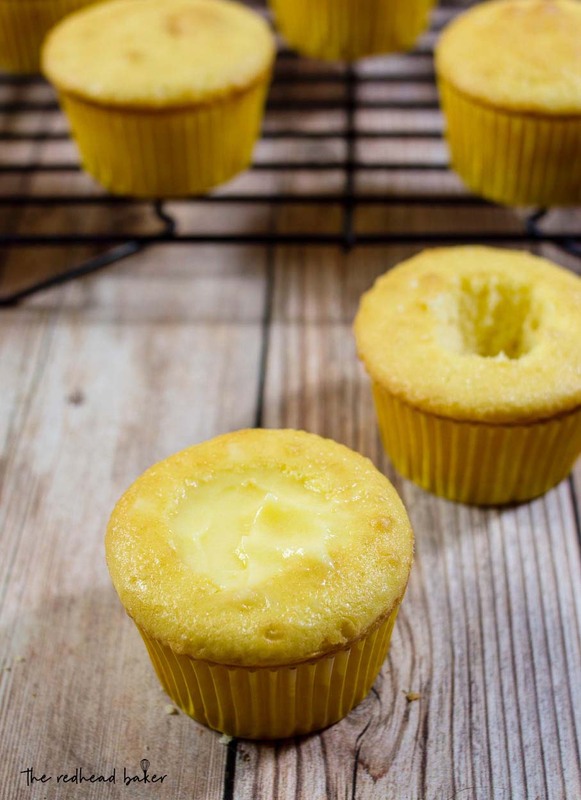 Use a small round circle cutter (about 3/4 of an inch in diameter) or a paring knife to cut a hole in the center of each cupcake, ensuring you don't cut all the way to the bottom of the cupcake. Spoon about 2 tablespoons of the pastry cream into each cupcake. Fit a piping bag with an open star tip. Fill the bag halfway with the whipped ganache. Pipe a dollop of ganache onto each cupcake. I think these might be featured the next time I make cupcakes for the legion. Yum. This looks more fantastic than the cake version! I know I would love these, I haven’t had boston cream pie in forever. I love the Cake Bible! What a great resource. Your piping skills are wonderful too. Sounds delicious. Love it: simple and evergreen ! Pinned !